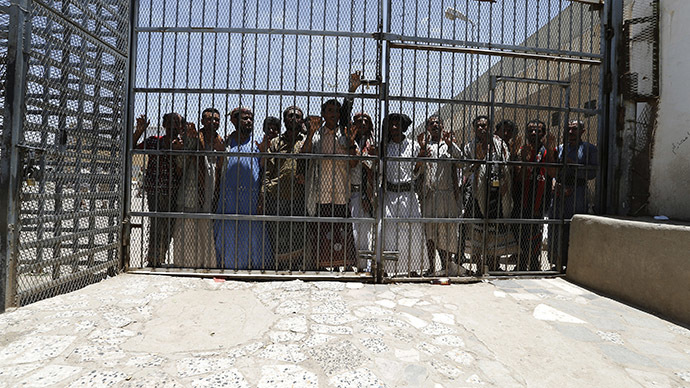 Around 1,200 prisoners, including some Al-Qaeda suspects, managed to stage one of the biggest jailbreaks in years in Yemen’s south-eastern town of Taiz, after violence broke out and guards abandoned their posts, according to officials. “Groups of Al-Qaeda supporters ... today attacked the central prison in the city of Taiz and more than 1,200 of the dangerous prisoners escaped,” the Saba state news agency quoted a security official as saying. This marked one of the biggest prison escapes in the country in the last few years, signaling a lack of security, as various forces fight to gain control of the country. Another official confirmed to Reuters that some of those who escaped were “suspected of belonging to Al-Qaeda,” adding that they were able to make their getaway as militias clashed in the city. “Heavy fighting took place near the central prison and the popular committees approached and seized control of the area, but Saleh’s forces opened the prison doors,” the official said. Tensions in Yemen resurfaced when Shia President Saleh was deposed in 2012. His Shia Houthi supporters, reportedly aided by Iran, seized the capital city of Saana in September of last year, sending the current Sunni President Abd-Rabbu Mansour Hadi into exile. Houthi forces advanced to Taiz in March, as part of a southward push. A Saudi Arabian-led coalition responded with airstrikes, but has not been able to make any significant progress, as Yemen’s army units, which are loyal to the country’s ex-president and Houthi ally Ali Abdullah Saleh, are putting up a stiff fight. Officials accused Saleh’s army forces of allowing the prisoners to escape while militiamen advanced. Meanwhile, Al-Qaeda-linked Sunni groups are fighting against Houthi forces in various parts of Yemen, labelling them apostates worthy of death. This has been the third serious jailbreak since the Saudi-led air campaign began on 26 March. One of the most recent occurred in April, when prisoners broke out of a prison in the eastern city of Mukalla after army forces had left the city.